I managed to find a few minutes over the weekend when it wasn’t raining to erect two wigwams for my climbers – the Sweet Pea ‘Cupani’ and also for the French Bean ‘Blue Lake’. One of the bamboo cane wigwams. 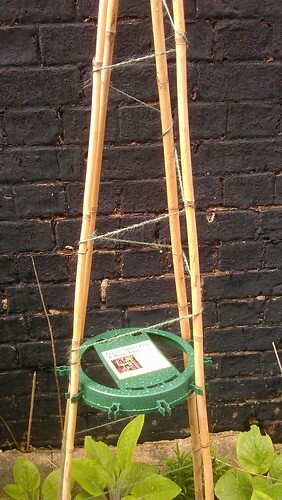 I’ve used a collection of bamboo canes and some strong garden twine – tying the canes at the top and then winding the twine around and down the full length of the wigwam – making sure that wrapped twine around some of the canes on the way down in order to give it all some strength and also to encourage the climbers. One of the wigwams didn’t have the same number as canes, so i added a cane gripper in the middle to help hold everything together. Based on previous years experience, this means that the UK will now experience gales – as the wind tries desperately to blow them down. As it started to rain, I returned indoors where I then set to sowing the French Beans in pots – now’s the ideal time to do this. It’s so important to keep seedlings moving at the moment as it’s easy to get behind and end up with some pot-bound or hungry plants. This week was the turn of the second batch of the Salvia ‘Farinacea Victoria’ that I sowed back in March to bump up the low numbers of the January sowing. There’s quite a difference between the January and March sowings of Salvia ‘Farinacea Victoria’. There were 8 new seedlings in all, bringing my total to 12. These will join the Nepeta ‘Six Hills Giant’ and last year’s Salvia to bring a wash of blue flowers to the garden in a bid to encourage and support more bees. The Salvia ‘Farinacea Victoria’ all pricked-out and potted up. 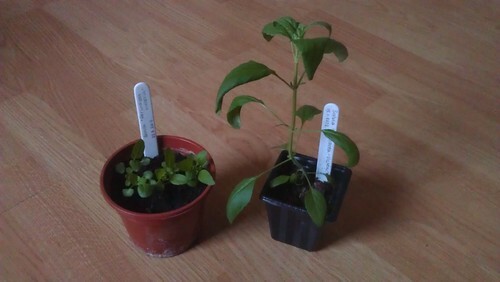 They vary in size despite being sown at the same time. 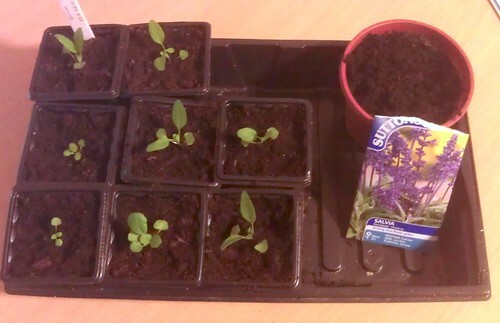 The two smallest Salvia have gone into the propagator with the Dill and Courgette ‘Black Beauty’ seeds that I sowed a few days ago, in a bid to help it grow on. Btw, one of the courgette seeds has already germinated!! Best way to grow courgettes? I’ve grown Courgette’s in the garden – one year producing loads, last year they died from mildew. I’ve grown them in pots before but unsuccessfully (they were small and waxy and generally unappealing). What’s your trick?